Indian pudding: made by Pilgrims from Native American cornmeal. Photo by Tammy Donroe, FoodOnTheFood.com. CAPSULE REPORT: In honor of National Indian Pudding Day, November 13th (some celebrate it on February 17th), a history and recipe for Indian Pudding, a classic New England dessert. 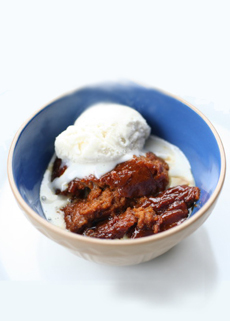 The name Indian Pudding doesn’t imply that it’s a Native American (or Pacific Rim) recipe. The Plymouth Colony emigrants were accustomed to warm plum puddings, bread puddings and the like. But flour was scarce—no wheat grew in New England. However, corn grew; the native Wampanoags had plenty of cornmeal. So “Indian” pudding was born, using cornmeal plus butter, eggs, milk, molasses and spices such as as cinnamon and ginger. The pudding was topped with heavy cream. None of these were Native American ingredients. The word “Indian” referred to the corn—hence Indian pudding, Indian bread (cornbread) and so forth. Jasper White is a great American chef. He worked in venues across the country before settling in Boston, where he and Lydia Shire presided over some of the city’s venerable hotel kitchens and introduced Boston to contemporary American cooking. He then opened the award-winning Jasper’s Restaurant, Boston’s premier restaurant destination for 12 years. In his years as in Boston, Chef White researched New England cuisine and became an authority on New England foods, one of which is Indian pudding. Chef White prefers to serve Indian Pudding with heavy cream, which is delicious—and is the perfect topping for leftover Indian Pudding enjoyed for breakfast (or for fewer calories, use milk or half-and-half). But in our opinion, you can’t beat a scoop of vanilla ice cream, which provides its own creamy topping as it melts into the warm Indian pudding. 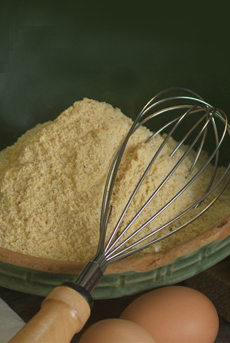 Yellow cornmeal from South Texas Milling. Grease a 1-½ quart soufflé mold or baking dish with 1 tablespoon of the butter; set aside. Heat 3 cups of milk in a saucepan until it is close to boiling. Add the cornmeal and reduce heat to low. Stir until the mixture thickens (about 5 minutes). Remove from the heat and add the remaining butter, the molasses, maple syrup, cinnamon, ginger, salt and egg. Pour into buttered dish. Pour the cold milk over the pudding and return to the oven. Cook for 1 hour and 30 minutes to 1 hour 45 minutes until the top is brown and crisp. Serve hot or warm with topping of choice. Serves six to eight. Reheat leftover pudding before serving.